Colours: As well as green (as pictured) the tent is available in red and sand. I’ve had long experience of the smaller Hilleberg Nallo. One of these tents was our home as we walked 4,000 miles across Europe for 11 months during 2003-4. Weighing in at around 2.4kg, the tent was of reasonable weight for the interior room it gave for 2 (more than 6 foot long inner tent) – whilst being stable and tough enough to take in every weather condition from 40C temperatures during a summer heatwave in Spain and France, through torrential rains that led to a state of emergency being called in the foothills of the Ligurian Alps of Italy, to below -10C in the winter in the Pindos mountains of Greece. 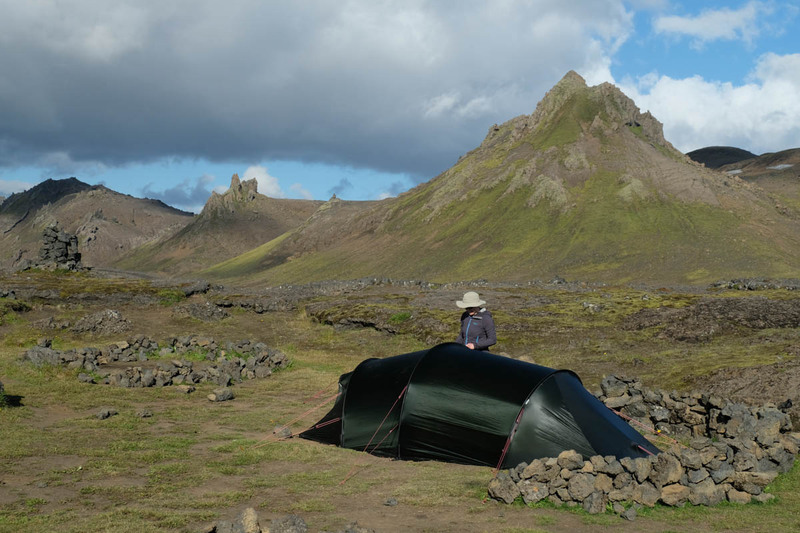 The inner and outer pitch together – enabling erecting the tent in the rain without getting the inner wet – and the two pole tunnel design is a doddle to pitch well. The tent – alread a few years old at the start of that trip – survived brilliantly, though the groundsheet was punctured by camping in chestnut forests and some years later it eventually gave up the ghost as the elastic began to perish. So it was with high expectations that we received a Nallo 2 GT for testing this summer in both the wilder parts of Scotland and for a trek in Iceland – which has even less reliable weather! We found that the design of the Nallo 2 is broadly the same as before – with several excellent small improvements such as better ventilation options at the foot of the tent; it is also now supplied with 20 superb light and strong pegs, all with neatly tied cord for easy retraction from hard ground. The inner tent is of the same dimensions as the Nallo 2, but the GT version has an additional pole and a larger flysheet that gives a luxuriously huge porch – at the cost of an extra 500g. Why would you want such an addition – and is it worth the extra weight? The larger porch can be opened on either side, with one side opening adjacent to the inner tent and the other side nearer the front; the smaller Nallo 2 has a more cramped entrance at the front. 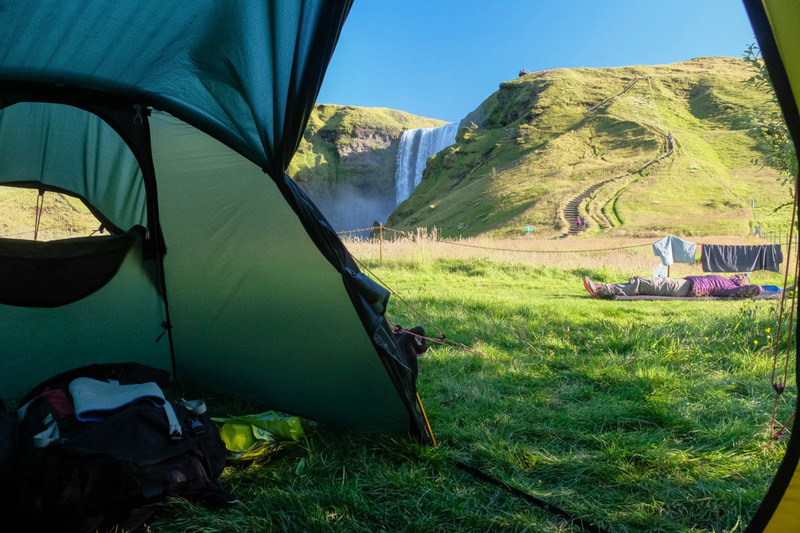 The larger Nallo 2 GT porch gives great flexibility and makes it much easier to get in and out of the tent comfortably without getting any moisture inside – you can remove your waterproofs in the porch. It also enables you to cook more easily with protection from the elements, taking great care and with one of these doors open. During our Nallo 2 GT test we’ve camped very comfortably with several nights of pouring rain, and the tent is stable in high winds as long as it isn’t pitched side-on; from experience with the Nallo 2 the tent would be great for year-round Scottish use except on the summits. 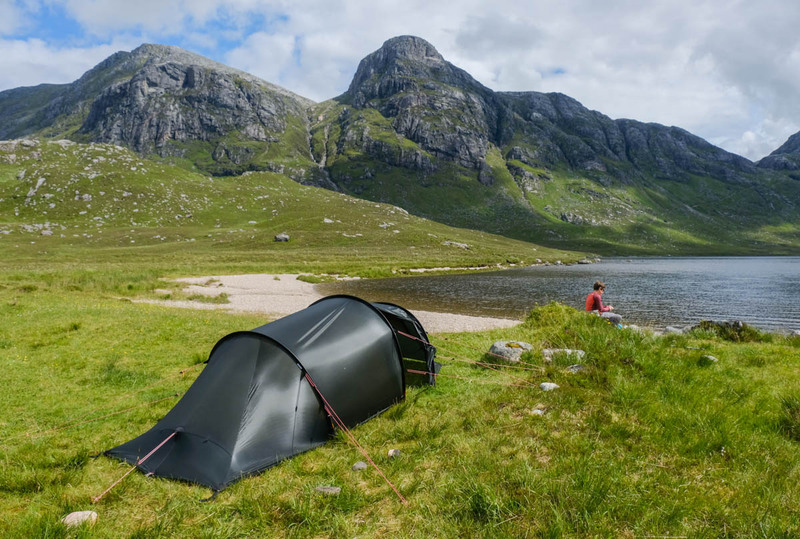 I’d say that if you were expecting to backpack with the tent over several days and were expecting rain – such as on the Cape Wrath Trail – then the additional weight for the large porch is well worth it between two people. In drier conditions I’d go for the lighter Nallo 2. The Nallo is one of Hilleberg’s Red Label tents, which sit in the middle of their range; the Anjan (also available with and without the GT porch) is the lighter ‘Yellow Label’ version but the flysheet doesn’t quite reach the ground which means it isn’t really so suitable for Scottish conditions where driven rain and snow are common. The Nammatj is the ‘Black Label’ version which is heavier but stronger – suitable for more extreme use. As with all Hilleberg tents, the price is very high, but if you are looking for the best quality manufacture in a backpacking tent for two that really won’t let you down, it’s hard to beat the Nallo 2 and Nallo 2 GT. Advantages: High quality materials and construction, 4 season toughness and very stable in high winds, huge porch, long inner tent length, durable, lightweight for the size on offer. Disadvantages: That quality comes at a very high price.